Bronze has been positioned as the medium par excellence for sculptural production bearing the aesthetic, symbolic and poetic values that have propitiated the construction of a metallurgical archetype, which has its genesis in its physicochemical, metallurgical and mechanical properties. Of these properties, the formation of the patina is the one that contributes most to the construction of its poetic image, since it is the one that, along with the form, suddenly appears before the spectators, directly affecting their perception of the work. 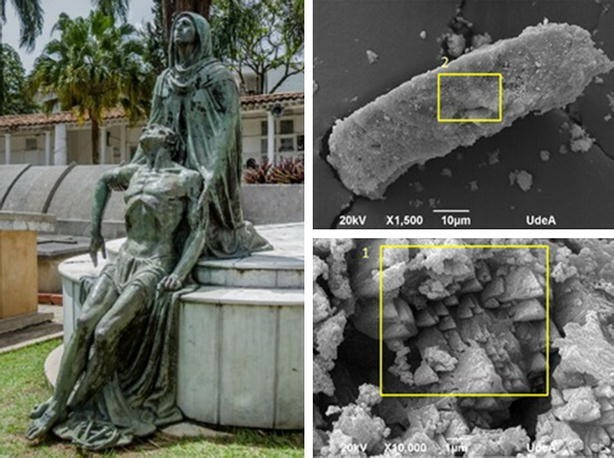 To exemplify this, we analyze the patina of the sculpture La Piedad by Bernardo Vieco using SEM–EDX and XRD. The results show a non-protective patina that, added to the other factors of deterioration of the work, contribute to the drama of the scene that is represented, taking it from pain and impotence before the death of a loved one, to a state of hopelessness and apathy embodied in a bronze that deteriorates over time with environmental factors and neglect in the protection and conservation of the work. Sculpture La Piedad of Bernardo Vieco and some of their samples evaluated. Formulating an analysis of the poetic image of bronze requires a blend of the science of materials, art and philosophy. The science of materials, because it is right there, in the very nature of the material where all the aesthetic, historical and cultural values associated with this metal are born; art, because they are mainly artistic objects as opposed to everyday objects, those that gather the culture—understood as all human activity—from each era, and transfer that information to new generations; and philosophy, because it takes a reflexive thought, which allows the approach to the metal from a different perspective that interlaces the human and the scientific with its own material nature. There have been various methods developed over the course of history to understand the material and the phenomena associated with it. However, it could be said that in the current paradigm of knowledge, the physicochemical, metallurgical and mechanical phenomena of metals are studied with the scientific method, which is based upon experimentation, measurement and on the repeatability and refutation of its results. In turn, the aesthetic, symbolic, historical and iconographic properties of metals have been studied with various hermeneutical methods, which are based upon all knowledge being the result of interpretation. These two methods propose time-based studies that contradict the immediacy and variability of a phenomenon, such as the poetic image, which occurs in the human psyche in a sudden manner and which can also affect other souls, Other hearts, in spite of all the barriers that reason can impose. For this reason, it is necessary to come at this from the phenomenological method, which studies the phenomena as they are presented as well as the way in which they are lived by each person. This method allows us to consider the emergence of the image in an individual consciousness, to be able to restore the subjectivity of the image and to measure its amplitude, strength and sense its transubjectivity. The analysis of the construction of the poetic image of bronze will start from the phenomenological studies made by Gaston Bachelard (France 1884–1962. Philosopher, critic, epistemologist, scientist and poet), about the image that arises in the consciousness from reading a poem, where the poet provides images never before imagined by the reader, making him marvel at the very moment in an innocent way and, by activating the participation of the creating image, a poetic image emerges . However, knowing the poetic image of a material requires a method that allows us to take the very moment in which an object constituted of that material suddenly appears before a person, who immediately builds in his psyche an image independent of his own preferences, of the intentions of the artist, of the references to the forms of the object and the history of the material itself. “… a series of images that summarize the ancestral experience of man in the face of a typical situation, within circumstances that are not particular to a single individual, but can be imposed on every man” . However, changes in human interests and in the material constitution of bronze as a result of interaction with the environment, generate new experiences with this metal that activate the human psyche to enrich and renew the bank of images that give shape to that metallurgical archetype, which interweaves its particular features as the scarcity of its raw materials and metallurgical difficulties for its production, with cultural values such as “expensive” and “elitist” and resistance to corrosion, with values such as “perenniality”. “On the contrary: through the brilliance of an image, the distant past resounds with echoes, and it is hard to know at what depth these echoes will reverberate and die away. Because of its novelty and its action, the poetic image has an entity and dynamism of its own;” [3, p. 8]. “…that is, in reverberation that I think we find the real measure of the being of a poetic image…. In this reverberation, the poetic image will have sonority of being.” [3, p. 8]. …“a study of the phenomenon of the poetic image when it emerges into the consciousness as a direct product of the heart, soul and being of man, apprehended in his actuality”. [3, p. 9]. Thus, this study aims to show the characteristics of bronze that contributed to the construction of its metallurgical archetype, demonstrating with the history of its use mainly in Colombian art, the process of evolution of this archetype. Of the four characteristics that will be explained later, it is found that the patina that has per se aesthetic values and historical contributors to the formation of the archetypal bronze image related to perenniality, is precisely the quality of the material that presents the blow to the spectator, being constituted in fundamental part of the image that projects the work and therefore of what it communicates. Thus, as a bronze sculpture is an inanimate object, it is precisely the patina that allows the emergence of new poetic images of the work, allowing the emergence of individual and intimate affectation, independent of previous knowledge in metallurgy and art and much more, of all the intentions of the artist. As described by Pliny the Elder in his book XXIV of Natural History, the Greeks were the ones who initiated the tradition of highlighting and perpetuating the memory and values of the winners of the Olympic Games and making them into examples for communities through the statues of bronze. Pliny also says that perhaps the first public statue that was erected at the expense of the Athenians was that of the tyrannicides Harmodius and Aristogiton (The Assassination of Hipparchus of Athens, 514 BCE) and that from here, this practice was later universally adopted to adorn the squares of all cities. Following the Greek tradition inherited through the Spaniards, the first appearances of bronze monuments in Colombian public space took place in the process of conformation of the new republic where, in order to preserve the legacy and the memory of the heroes and dignitaries of independence and outstanding men of the country, were erected statues of personages like Simón Bolívar, Francisco de Paula Santander and Atanasio Girardot, among many others. However, this type of orders was requested by the ruling classes whose preferred artistic style was Neoclassicism, limiting the plastic expression of the sculptors and making them fall into formal repetition. On the other hand, the theme always focused on highlighting these important personages and finally, the costs of production were too high as the country’s technological development, specifically for the bronze foundries, was in very precarious conditions, there was also a greater interest in developing iron metallurgy . As if this were not enough, the commissions were always given to foreign artists who came to Colombia as sculpture teachers such as Raúl Carlos Verlet, César Sighinolfi and Luigi Ramelli, among many others . Thus, the lack of knowledge of the metallurgy of bronze at the high level required for the production of the statues made it almost impossible to create a company capable of sustaining this in the national territory. Perhaps the first experience of this type was the production of the bust of Atanasio Girardot, modeled and fused by Francisco Antonio Cano in the Estrella de Velilla and Escobar workshops in 1910 . One of the most outstanding students of Francisco Antonio Cano was Marco Tobón Mejía, , who developed all his work from Paris, where he also opened a foundry workshop and produced, among other works, the statue of Rafael Núñez modeled by Francisco Antonio Cano, One of the few monuments made by a Colombian artist at the beginning of the 20th century. Following the path laid out by Cano and Tobón, it would be Bernardo Vieco who would establish the first bronze foundry in the country after his trip to Europe, where he learned different techniques that he could contextualize in the country’s technological situation of the time, adjusting the procedures to match locally available resources. Vieco’s implementations included the production of molds in Portland cement and the adjustment of the furnace to Bogota’s environmental conditions for the bronze smelting, with which he was able to efficiently produce large-format sculptures and several methods of casting that allowed him to optimize the available resources, making him a specialist in this area on the national level . Outstanding students of Vieco were Jorge Marín and Rodrigo Arenas Betancourt, who began in the trade of bronze casting and sculptural production, the second being one of the most important sculptors in Antioquia and Colombia due to his monumental commemorative sculptures executed through official contracts. Later the bronze has been used by different Colombian artists as can be seen in Fig. 1, who have made their productions in national workshops such as El Sembrador de estrellas by Alonso Ríos and the Thinker by Nadín Ospina, among others. However, a few like Fernando Botero do all their production in Italy. As can be seen, bronze has been positioned throughout the history of mankind as a depository and communicator of the values of illustrious characters, models for humanity, from Greek times until today, being filled with symbolic, historical and poetic values that lie in its physico-chemical, metallurgical and mechanical characteristics. The first of these characteristics is the shortage of the raw materials for the production of bronze whose base metal is copper, being traditionally alloyed with tin, lead and zinc. The latter is also the main alloy to produce brass (Cu–Zn), which is sometimes used for the production of large format sculptures. The second characteristic is the metallurgical difficulty of the processes of casting bronze which results in a large number of defects that contribute to the detriment of the sculptures. The third characteristic is the possibility of recasting bronze objects with a low loss of alloys or even with the possibility to modify it to make different objects such as bells, cannons and statues that require different properties. This also contributes to the consolidation of bronze as a perennial material. In the ancient world bronze was a very precious commodity, so the sculptures made in this or other metals often disappeared when melted by conquering nations or a later ruler who was not interested in the art of his predecessor. That is why very few large bronze sculptures survived from those produced in antiquity . In Colombia there have been two types of attacks on bronze sculptures, the first one is related to its economic value, which as explained above is high, making these works, mainly those in public spaces, very attractive for criminals who steal them in, either entirely as in the case of the works of Jorge Marín Vieco  or partially as in the case of the whiskers from Fernando Botero’s Gato . On the other hand and more interesting from the symbolic and poetic point of view of bronze works are the deliberate attacks against some monuments with intentions of political retaliation in times of social tension where busts and statues of political leaders have been torn down, blown up and even melted by their detractors, such as the monument to Jorge Eliecer Gaitán . The fourth characteristic and perhaps the most determinant in the poetic image of bronze is its interaction with the environment in which it is immersed, inducing a chemical transformation from the surface to the inside. This process known as corrosion has several causes in metals, mainly acid rain, environmental pollution (smoke, particulate matter), the excrement of birds and other living organisms, thermal shock and vandalism. Specifically in bronze, the corrosion products form a layer that in the majority of cases adheres to the surface of the sculpture called patina, which can be natural or artificial and serves to cover up the manufacturing processes, protect the base metal, give the desired appearance to the sculpture and also collects evidence of the history of the work and the environments to which it has been exposed . 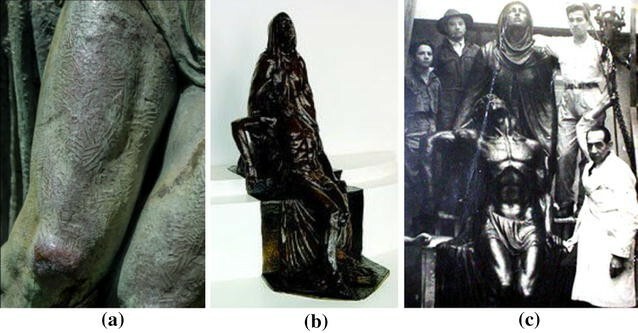 The corrosion products most frequently found in bronze sculptures located in urban centers are cooper oxides such as cuprite (Cu2O) and tenorite (CuO) , copper sulphates such as brochantite Cu4SO4 (OH)6 , and copper chlorides such as atacamite (Cu2Cl(OH)3 and paratacamite (Cu2Cl(OH)2). Traditionally for the sculptures in public spaces, artificial patinas of homogeneous color applied throughout its surface, which correspond to the aesthetic values that the artist wants to give to the work, are frequently used. The colors and textures of these patinas depend on the chemical composition of the metal, the chemical reagents used, the temperature and the application methodologies. However, when a patina is exposed to the environment it undergoes a new transformation as a result of natural or anthropic processes and the passage of time, forming a unique layer that is what finally determines the perception we have of bronze objects. 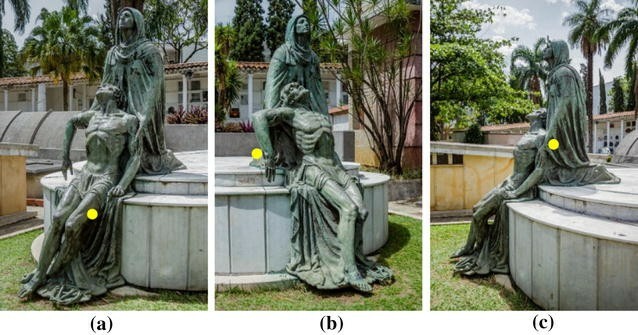 Under certain environmental and care conditions, the artificial patinas are preserved, but in the great majority of cases that we observe in Colombian sculptures in public space, the patina becomes a function of the corrosion products that have been generated. Thus, the patina of bronze gives the work an aesthetic value and a historical value. Some positions suggest that the patina would be an integral part of the aesthetic value of a work only in the cases in which the sculptor has foreseen this. In those cases where it has formed naturally, independent of its beauty, it possesses only a historical value of an extra-artistic nature, which in theory may even be incompatible with the correct reading of the work . On the other hand, the Carta de Restauro of 1987, emphasizes the preservation of patina in restoration processes, as long as the patina really protects the metal, so that the antiquity of the work can be perceived, that is to say it gives aesthetic value to the transformations of the material . As a case study, an analysis was done of the funerary sculpture La Piedad (1950) by Bernardo Vieco Ortiz (1886–1956), located in the San Pedro Cemetery Museum in the city of Medellín. The play represents the drama of human pain in the face of the loss of a loved one using the iconographic image of the descent of Christ dead in the arms of Mary. The sculpture is cast in a copper base alloy. Vieco was the first artist to have a bronze casting workshop dedicated to the production of sculptures and decorative objects in Colombia. The proximity of the work to the viewer allows one to easily take samples. The work is located in the most important cemetery in the city, where the mausoleums of various personages are found, therefore it has been more protected from anthropogenic interventions than the works found in parks and squares. This shows the deterioration generated mainly by environmental factors. Within the information collected, no evidence of cleaning or restoration of the work was found from the time of its installation. First, a visual observation was made that permitted the finding of the points that presented defects and irregularities in the bronze, some of them can be seen in Fig. 2, as well as the different products of corrosion. For the purpose of this article it was very important to determine the presence of some chemical elements that are characteristic of non-protective patinas, such as chlorine, as in our case the stability of the patina is related directly with the concept of the poetic image of bronze. The analysis of this type of works is quite difficult since the norms of patrimonial conservation do not allow one to take quantities of material sufficient to make laboratory analyzes with conventional techniques, since this would be to the detriment of the work either by the loss of matter or by the destabilization of existing patinas. There currently exists portable equipment like the X-ray fluorescence spectrometers, which have proved to be very effective for the characterization of the patinas in sculptures and bells . 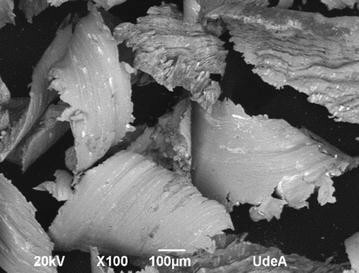 Unfortunately, for the present investigation we could not count with any of this equipment in order to make a characterization in situ, for this reason the samples of the analysis of the corrosion products were taken with a scalpel by grazing and a JEOL JSM-6490LV Scanning Electron Microscope was used to observe the morphology of the corrosion products and the energy dispersive X-ray spectroscopy tests (SEM–EDX) for the chemical composition. The samples were mounted on a carbon tape and gold sputtered with a Hummer 6.2 apparatus at 15 mA AC for 30 s to obtain a thin AU film of around 1 nm. These analyses were complemented with X-ray diffraction (XRD) to properly identify the primary species present. X-ray diffraction (XRD) characterization was done with an X’Pert PRO diffractometer (Cu Kα radiation, λ = 1.5406 Å), using a 45 kV voltage and scanning between 10 and 80º. The sampling points can be seen in Fig. 3 and the sampling methods in Fig. 4. In Fig. 5 and Table 1 the results obtained for the chemical composition of the base metal made on the sample obtained from the base of the Christ can be observed. Unfortunately it was not possible to take samples of the base metal of the figure of Mary. In Fig. 6 and Table 2, the results obtained from the performed analyzes on the corrosion products can be observed. The XRD tests summarized in Fig. 7 show that the corrosion products are similar to those already reported in literature for these type of alloys [16–19]. For sample 1, see Fig. 7a, Cuprite (Cu2O) and Tenorite (CuO) phases were identified. 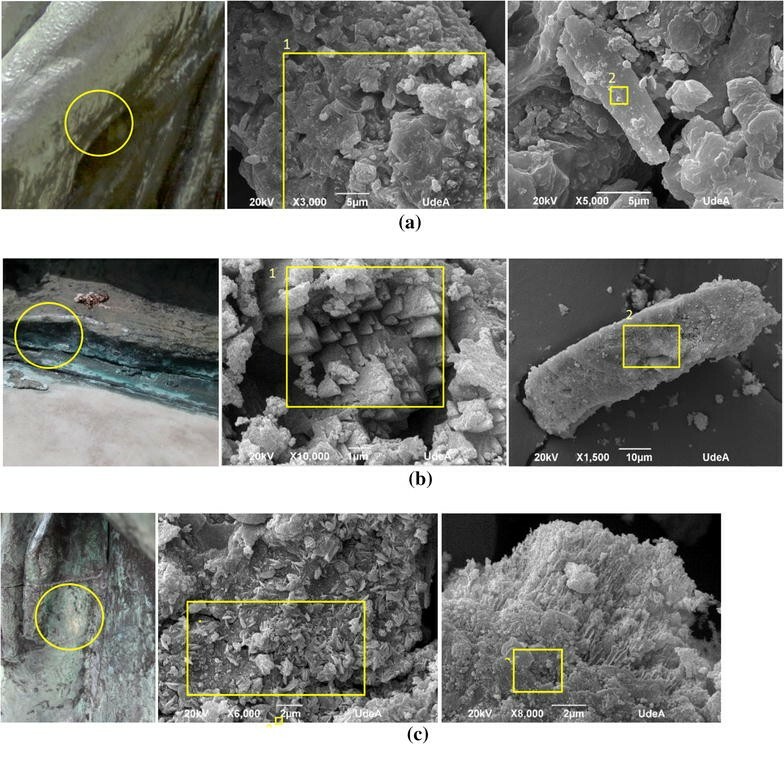 Furthermore, the presence of hydrosulfate of hydrated copper (Cu5 (SO4)2(OH)6·5H2O) and of Atacamite phase (Cu2Cl(OH)3) were detected. In sample 2, see Fig. 7b, the presence of Cuprite and Azurite (Cu3(CO3)(OH)2) were observed. In sample 3, see Fig. 7c, Cuprite and Tenorite phases were distinguished. The chemical analyses, the differences in texture, and differences in color of the patinas of La Piedad indicate that the Christ was apparently cast in a brass, while Mary was cast in bronze. Both figures show high contents of chlorine in their patinas which gives indications of the presence of a non-protective patina. In addition, the work shows black spots on its surface produced by the deposition of organic material and atmospheric pollutants combined with the products of corrosion such as dark green Brochantite, under which Atacamite can appear and which is reported in the XRD in sample 1. Now, in order to appreciate the contribution of the patina to the poetic image of bronze in the sculpture La Piedad, it will be necessary to consider two categories of analysis, the first being the aesthetic value of the patina, which will be linked with the considerations taken into account by the artist to give the final finish to his work. According to the information collected, the original patina of La Piedad was dark brown, possibly formed by copper oxides, of which there are some remains in the sculpture as can be seen in Fig. 8a, in the results of the analyses of sample 3 presented in Table 2 and XRD of all samples. On the other hand, in the model of the work that is in the Antioquia Museum  and can be seen in Fig. 8b there is a dark brown patina, homogeneous and with a waxy gloss, as can be seen in Fig. 8c of the Vieco family photographic archive . As can be seen, this patina differs completely from the present one, which affects the perception of the spectator, since although it is clear that the scene represents the psychology of human pain and impotence before the inevitable, it could be said that the darkness of the original patina gave visual weight and gravity to the psychology represented by the work, but giving account of the validity, immutability and durability of this deep and infinite pain, accepted with resignation and hope, which is characteristic of a funerary sculpture framed in The Christian context. On the other hand, the type of deterioration that the work presents at present, evidenced in the chlorine content of the products of corrosion, in the variety of blue and green patina shades, in the black spots, the fissures and the loss of cohesion of the parts that comprise it, not only accentuates this immanent pain, surpassing the limit of the impotence expressed in the face of Mary, but also reaching the hopelessness embodied in a material that dissolves over time, with exposure to aggressive environments and for abandonment to their fate, without human mediation to protect it. Thus, as the poet Rogelio Echavarría would say, “Bronze is no longer eternal” . The second category of analysis is the historical value of the patina, which not only accounts for the aesthetic values proposed by the artist, but also gives the work a life of its own according to the changes in the material that conforms it, contributing with its color, texture and stability to the strengthening or weakening of the expression of the artist. So, as we saw with La Piedad, it could be said that this image of deterioration and abandonment strengthens the image of pain and bereavement of the loss of a loved one. Bronze has physicochemical, metallurgical and mechanical properties that allow the obtaining of detailed and complex forms in different sizes, depth in the low reliefs, ease of reproduction and durability, qualities difficult to find in other materials, reasons why the Greeks preferred marble, achieving works of high technical and aesthetic sophistication, bequeathing this tradition to future generations, heirs of their culture. However, the scarcity of raw materials and metallurgical difficulties mean that the production of a high-quality bronze sculpture requires highly qualified personnel, adequate equipment and raw materials, which are obtained mainly in countries with a grand sculptural tradition such as Italy and France. This makes the production of sculptures at the national level more expensive and makes them a symbol of prestige and power, used mainly for the elaboration of official orders or by sculptors of high economic level, which in turn stimulates the vandalism, theft and melting down of sculptures made in bronze. Although traditionally the copper base alloy used for the production of sculptures has been bronze, the results of the chemical analyzes reported for this work, as well as that reported in other studies of Colombian works, have shown that brass is frequently used . These two families of copper base alloys have large mechanical, metallurgical and physicochemical differences between them, so their behavior in the face of environmental factors is different. In La Piedad two alloys are used, the anodic potentials are quite similar, ranging from 0.35 and 0.45 V . Although this is a very small difference to generate a strong galvanic corrosion, it is reported that eventually can cause a deterioration in brass, . The metallurgical archetype of bronze consists of the images that have arisen in the psyche of people who have interacted in some way with this metal since ancient times and who have more evidence in the interaction with statues, monuments and works of art which, having a patrimonial legacy, enjoy greater protection and attention than objects of daily use. These archetypal images have their roots in the material properties of bronze, the patina with its aesthetic and historical values, which contributes most in the construction of the poetic image of this metal, reinforcing or weakening the expression of the artist in function of its stability or deterioration. In the case of La Piedad, we find that its patina is not stable and protective and that consequently this increases the drama of pain and impotence, taking it to the levels of hopelessness and bereavement characteristic of the death of a loved one, as evidenced in a bronze deteriorated by its iteration with the environment and by neglect in its conservation and protection. Upon the conclusions of this paper, authors are trying to manage with the Museum the restoration works of the sculpture. Finally, it can be said that the chemical analyzes allow a principle of reality for the sustentation of a philosophical and aesthetic position, as well as for the change of cultural paradigms. In the case specifically studied, it can be evidenced that due to the change of a protective patina for a non-protective patina, is detrimental to the perenniality of bronze, that symbolic quality in which the aesthetic and historical value of the patina, so appreciated by sculptors, poets, restorers, historians and the community in general. The work begins to be seriously threatened in contemporary times by high levels of pollution, degrading its material condition, affecting the reading and interpretation of the work, but in turn making possible the construction of new poetic images. CS conceived of the presented idea, developed the theory and experimental design. HAC and GV verified the analytical methods and bibliographic review. GV and CS take the samples and photographics. HAC and CS make the material analysis. All authors discussed the results and contributed to the final manuscript. All authors read and approved the final manuscript. Authors wish to thank to Cementerio San Pedro for the permission for collecting the samples. Doe. J, Martinez Arango R. Roban nueve esculturas del museo Salsipuedes. El Colombiano. 2011. http://www.elcolombiano.com/historico/roban_nueve_esculturas_del_museo_salsipuedes-DCEC_164106. Accessed 5 May 2017. Doe. J. Editorial Board (Consejo de redaccion). El País.com.co. 2012. http://www.elpais.com.co/elpais/cultura/noticias/asi-fue-robo-pelos-escultura-gato-fernando-botero. Accessed 5 May 2017. Doe. J, Padilla C. “Te mato dos veces”: el monumento público en Bogotá como objetivo de la muerte simbólica y venganza política. Tres casos de estudio. 2016. http://www.academia.edu/26921171/_Te_mato_dos_veces_el_monumento_p%C3%BAblico_en_Bogot%C3%A1_como_objetivo_de_la_muerte_simb%C3%B3lica_y_venganza_pol%C3%ADtica._Tres_casos_de_estudio. Accessed 5 May 2017. Doe. J, García Bello D. Dimetilsulfuro. 2013. http://dimetilsulfuro.es/2013/12/10/estatuas-bronce-historia/. Accesed 2 Oct 2016. Doe, J. Carta de 1987 de la conservación y restauración de los objetos de arte y cultura. 1987. http://ipce.mcu.es/pdfs/1987_Carta_BienesMuebles-Italia.pdf. Accesed 2 Oct 2016. Doe J. Fernández CA. La Piedad. Vivir en el Pobaldo, Ed. 261, 2013. http://vivirenelpoblado.com/portada/106/54-obras-del-museo-ed261la-piedad. Accesed 20 Nov 2016. Doe J. Contribución artísitca de la familia Vieco, 2015. http://www.marinvieco.com/index%20archivos/Grupo%20Empresarial%20Marin%20Vieco/marinvieco.org/public_html/bernardo_vieco_index.html. Accesed 4 Aug 2015. Doe J. Echavarria, R. Ya no es eterno el Bronce. Boletin Cultural y Bibliografico. Banco de la República. Vo. 38, Num. 58, 2001. https://publicaciones.banrepcultural.org/index.php/boletin_cultural/article/view/1199/1207. Accessed 10 Apr 2017. Rodriguez DA. Estudio y análisis de laboratorio de esculturas metálicas de Bogotá D.C. Policarpa Salavarrieta; 2004. http://es.calameo.com/books/001798017880f637784cf. Accessed 10 Apr 2017. Doe J. Galvanic compatibility corrosion guide. Engineers EDGE. 2017. http://www.engineersedge.com/galvanic_capatability.htm. Accessed 10 Apr 2017. Doe J. Guides to good practice in corrosion control. National Physical Laboratory. 2017. http://www.npl.co.uk/upload/pdf/bimetallic_20071105114556.pdf. Accessed 10 Apr 2017.